Picturesque Mandalay is famous for being the old royal capital of Myanmar. In the past, Burmese kings would have lived in the city and you can still see some of their palaces in evidence, and the city still have a royal feel to it which is very different from other spots like Yangon. Mandalay is also known for its Chinese and Indian immigrants as well as a mix of indigenous groups, and one of the best things to do here is spend time enjoying the varied cuisines on offer. Many visitors report that you can happily spend your time eating your way around the city on a trip here, as well as take in the majestic sites and some of the mot iconic buildings and monuments in all of Myanmar. Shwe In Bin Kyaung is a monastery in Mandalay but it is quite different from many of the other monasteries in the area which are usually very ornately decorated. 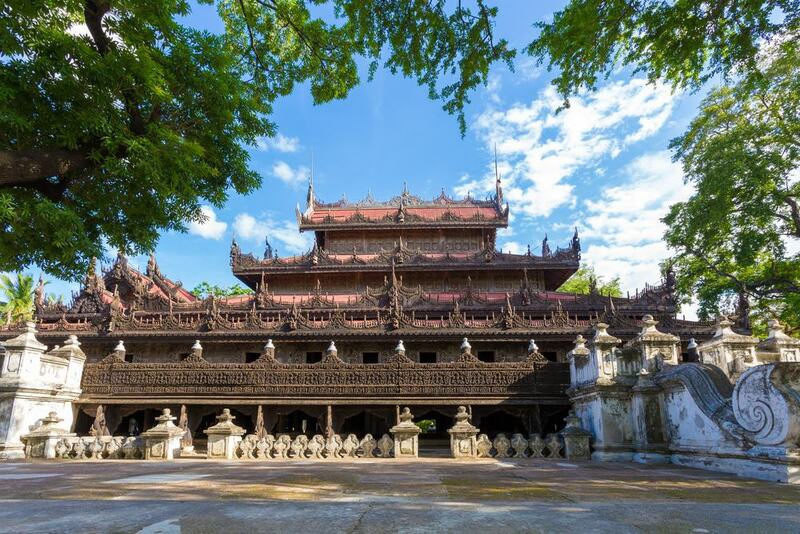 In contrast, Shwe In Bin Kyaung is built from teak which has been carved in intricate patterns which makes it one of the prettiest buildings of its kind in the city. The monastery was built in 1895 and was commissioned by famous Chinese jade trades and the main building is set on large poles made from tree trunks. On a visit here, make sure that you also check out the delightful interior balustrades as well as the roof cornices which are covered in detailed engravings. Mandalay Palace is actually not the original building but a reconstruction that was built in the 1990s. It is also not one building, but actually a series of 40 different houses that were built from wood to closely resemble the originals which would have been built in the 1850s and were sadly razed to the ground by a fire. 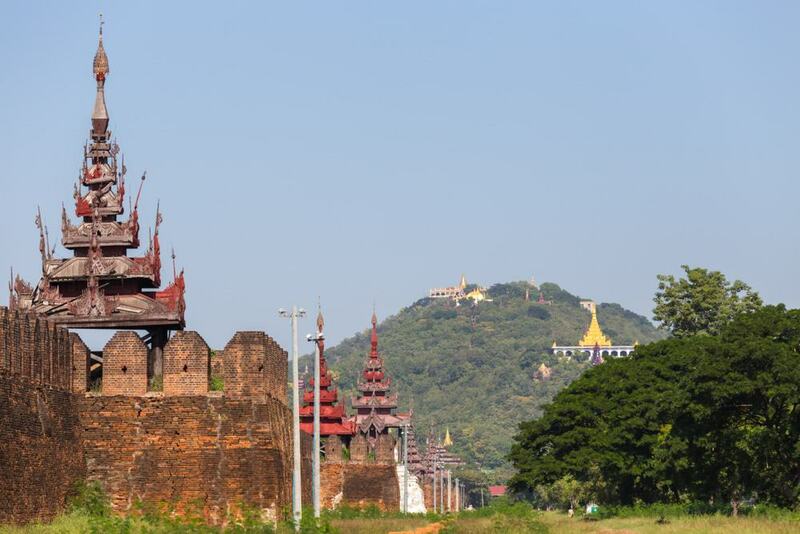 One of the highlights of a trip here is the wooden watchtower which is a great place to come if you want to take in the scenic views all over Mandalay. Also make sure to check out the ornate throne room which features a gilt pyramid and you can see other historical sights like a four poster bed that would have belonged to the king. Looking out over Mandalay is Yankin Hill which is topped by a pretty temple. 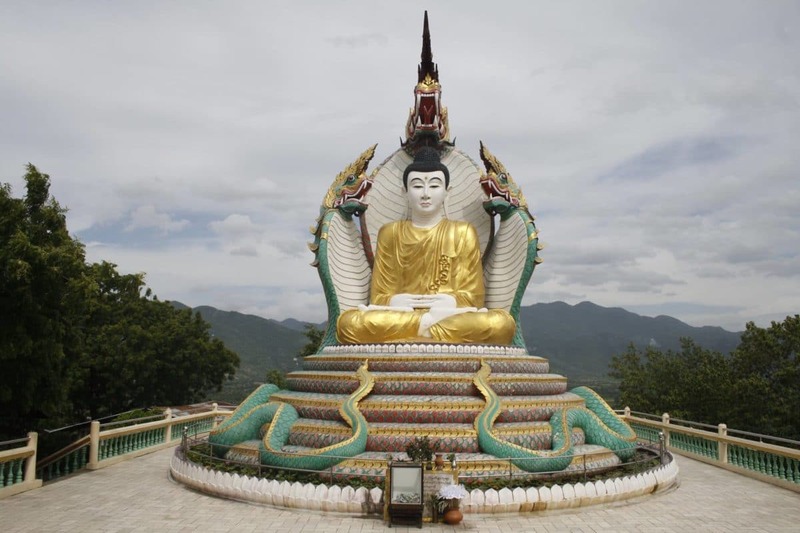 The main reason to climb the hill is for the chance to enjoy the sweeping vistas over the rice fields for which Mandalay is famous which also stretch to the foothills of Shan province. It takes around 10 minutes to climb to the top of the hill using a steep set of stairs and don’t be surprised if you come across the resident deer here as Buddhists believe that they will get good karma if they feed them. There are a number of walkways between the temple pagodas here and you can also check out the amazing fish statues which are covered in gold leaf. 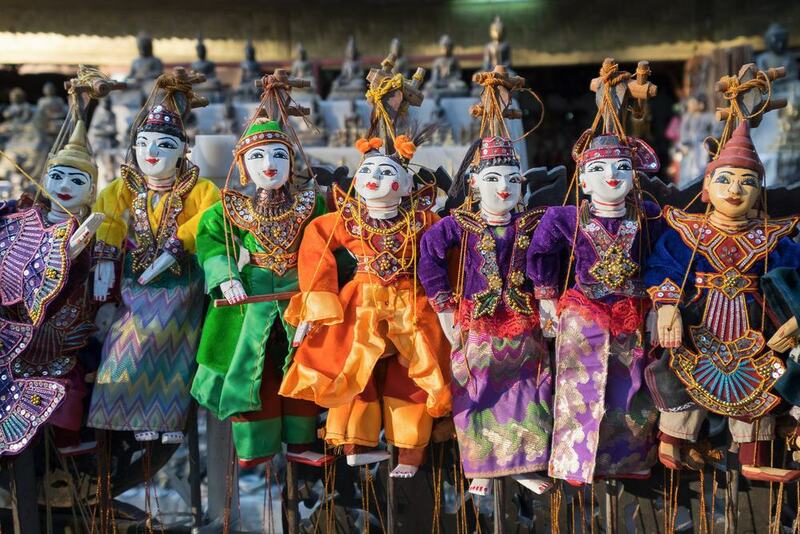 If you want to check out the local culture in Mandalay then there is no better way to do it than with a trip to the Mandalay Marionettes. 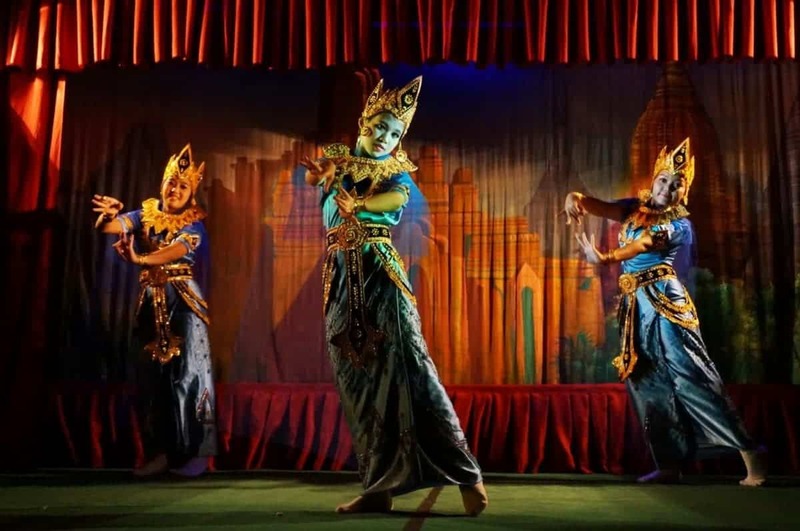 Here you will find a small stage and a colorful marionette show which usually tells the story of traditional Burmese legends. The puppeteers have been working here for years and they will also give you a tour backstage to see how the puppets work. You can also purchase puppets here if you are looking for a quirky souvenir to take home. 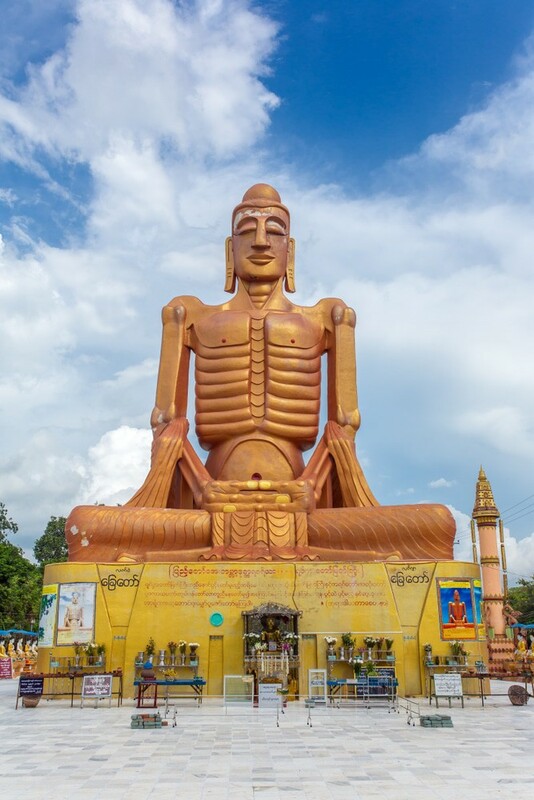 Mahamuni Paya is known for its seated Buddha statue which measures 13 feet tall. As you would expect, this is also a famous place of pilgrimage in Mandalay and the Buddha is said to date back some 2,000 years. When male devotees come here they are supped to apply gold leaf to the statue, and you can see the layers which are gently peeling off, and this also means that there is now a layer of gold leaf that is said to be 6 inches thick in places. If you make it here at 4 o’clock in the morning then you can watch the face of the Buddha statue being polished. If you want to see a show in Mandalay then a great choice is the Mintha Theater. Here you will find dancers wearing elaborate traditional costumes who perform up to 10 different regional dances for spectators. These usually tell the story of traditional folk tales and legends and this is one of the best ways to learn more about the local culture in Myanmar. Ta Moke Shwe Gu Gyi is a massive temple complex that is also known for being one of the most important archaeological sites in Myanmar aside from Bagan and Mrauk-U. It can take a bit of time to get to the site which is not clearly marked, but once here you will find a two storey temple which is made of bricks and ornate stucco figures. Some of the figures depict scenes from the life of the Buddha as well as traditional folk tales of animals, plants and deities. To get to Ta Moke Shwe Gu Gyi you will need to travel around 24 miles to the south of the center of Mandalay but it is more than worth it. 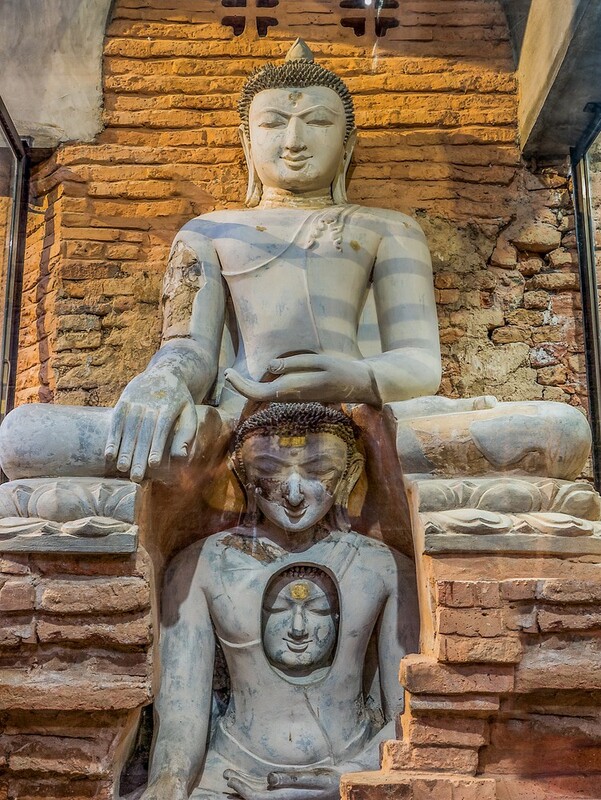 Some other highlights to look out for include what is called the ‘encased’ Buddha which is made up of three Buddha statues which were built one inside the other. 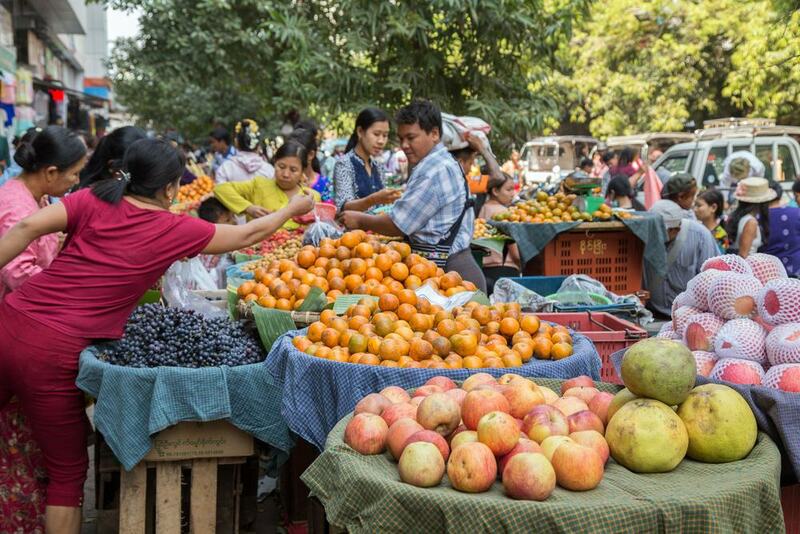 The best place to come in Mandalay if you want an authentic shopping experience is the Jade Market. 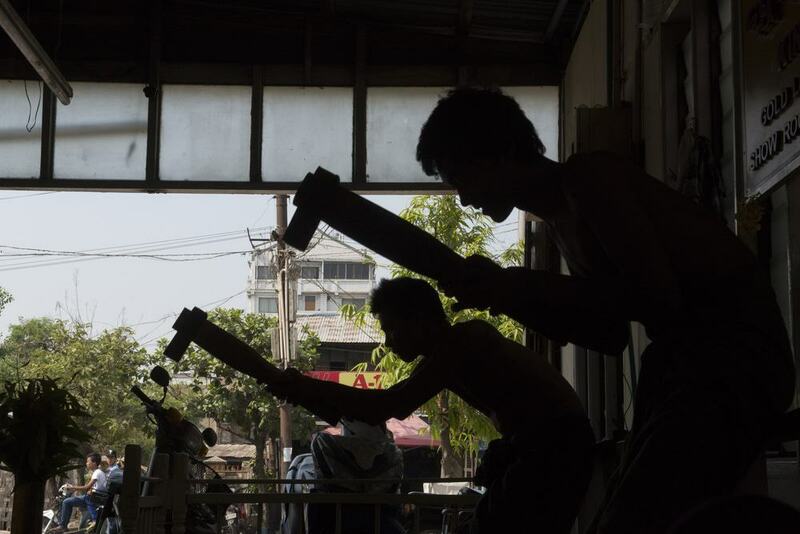 Here you will find the air thick with smoke from cheroots and, as the name suggest, this is one of the best places in Mandalay to pick up some jade pieces. Note that sometimes you will be asked to pay $1 for entry but it is more than worth it as, even if you don’t want to buy anything, you can watch the artisans at work as they grind, clean and polish the intricate pieces of elegant jade. Pinya used to be an ancient capital of Myanmar and would have had its heyday in the 1300s. It was the seat of power of King Thihthu and you can come here and check out the ornate brick stupas that would have been built when this was still part of a royal kingdom. Much of the complex is now overgrown which lends it a kind of ramshackle charm which in places is similar to the temples of Angkor in Cambodia. Each building contains a Buddha image inside and this is definitely worth a visit if you want to see a more rustic attraction in Mandalay. Shwekyimyint Paya was founded in 1167 by Prince Minshinzaw and it is said that this temple is actually older than the town of Mandalay itself. 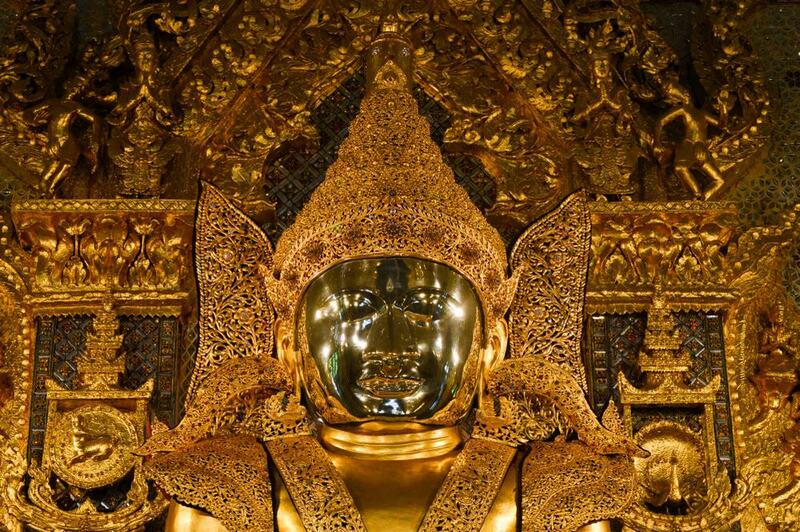 The site is known for the central image of the sitting Buddha that is meant to be built to scale and is covered in gold and sparkling jewels. 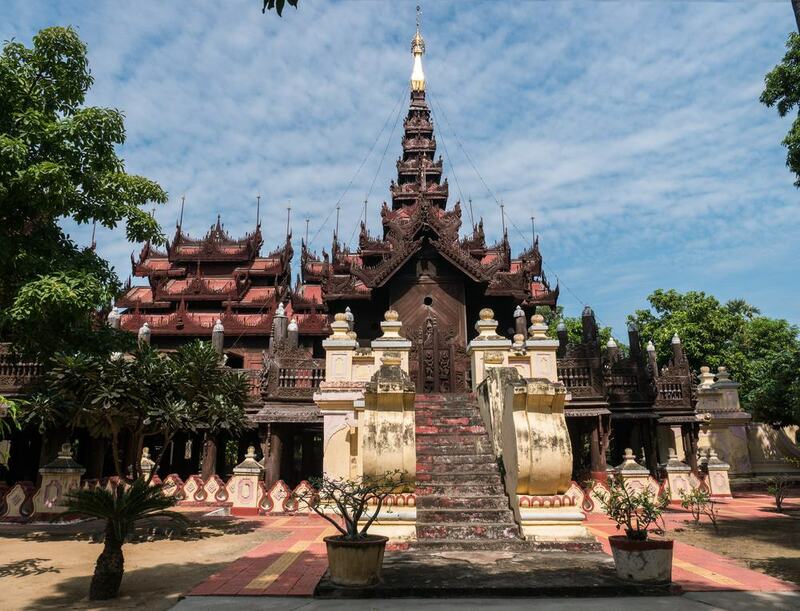 The central pagoda also has a number of images which would have been part of the collection of Myanmar kings of old and you can spend an afternoon here exploring dainty alcoves which have hidden murals and more images of Buddha. 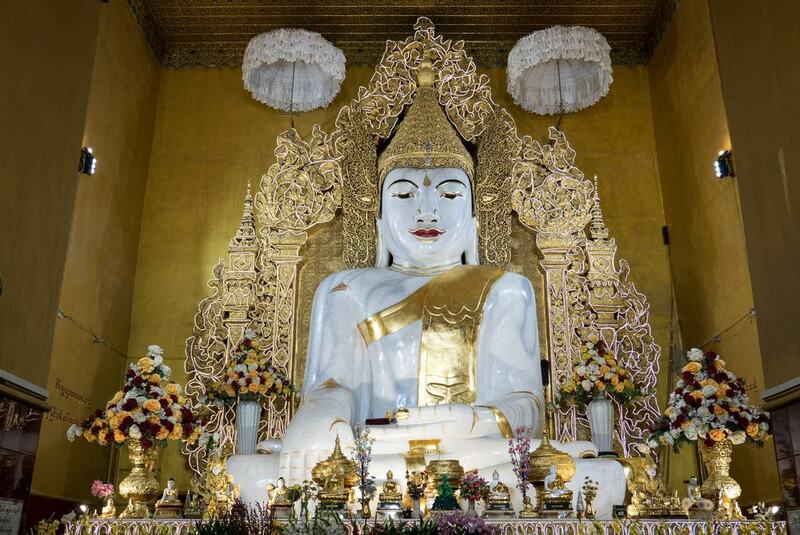 Kyauktawgyi Paya dates from the 19th century and its biggest claim to fame is the 900 ton statue of the Buddha that is housed inside and is 26 feet tall. The Buddha is also unusual as it is clothed in a royal costume and it was also carved from a single block of smooth marble. According to legend, it took 10,000 workers some 13 days to hoist the marble from a neighboring canal and the site was dedicated in 1865. 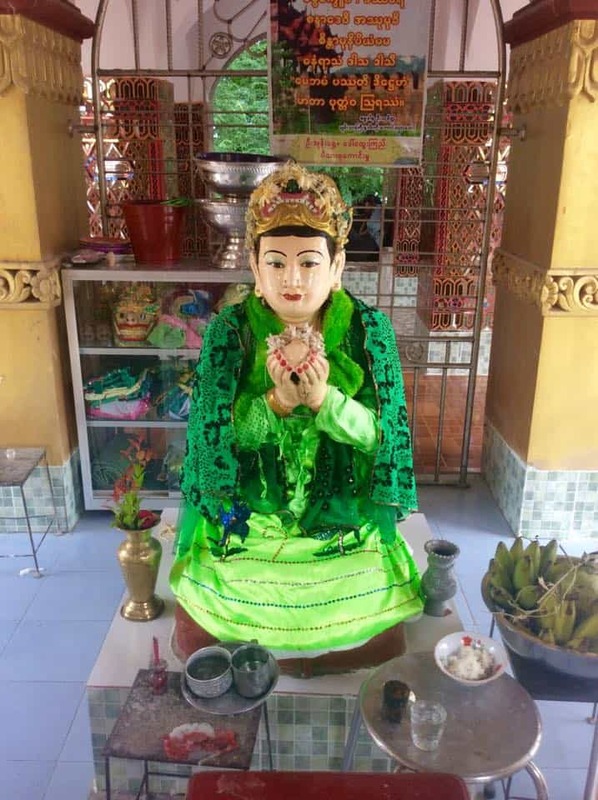 Make sure not to miss the outer walls which are covered in mirrored tiles and the little shrines in the other courtyards which have alms bowls and pictures of King Mindon who visited in 1865. 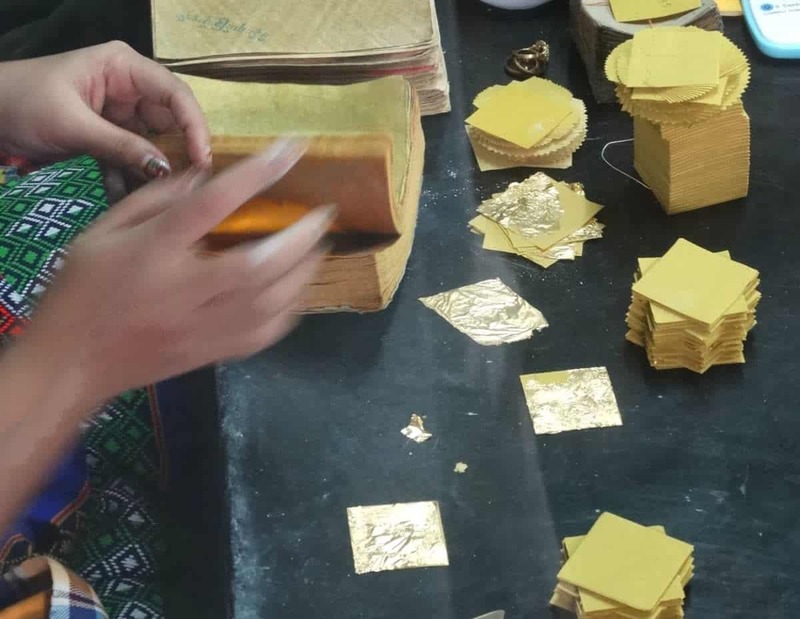 One of the most important Buddhist practices in Myanmar involves placing sheets of gold leaf on scared statues of the Buddha and with this in mind you can see where these sheets come from at a number of workshops in the city. These sheets are still pounded by hand and you can walk around the Goldpounders’ District which spans some two blocks in Mandalay. The Moat and Fortress Walls in Mandalay would have originally encircled the Mandalay fortress or citadel. You can only view the walls from the outside but they stretch for some 4 miles and soar to a height of 26 feet. There is also a 230 foot wide moat here and the site is actually a reconstruction that mimics the original style which would have been built in 1857. Make sure you check out the gate towers that top the walls at regular intervals and which feature intricately carved wooden pyramids. Shwenandaw Kyaung is a monastery which is known for its pretty carved panels that show Jataka scenes which are basically stories about the past life of the Buddha. 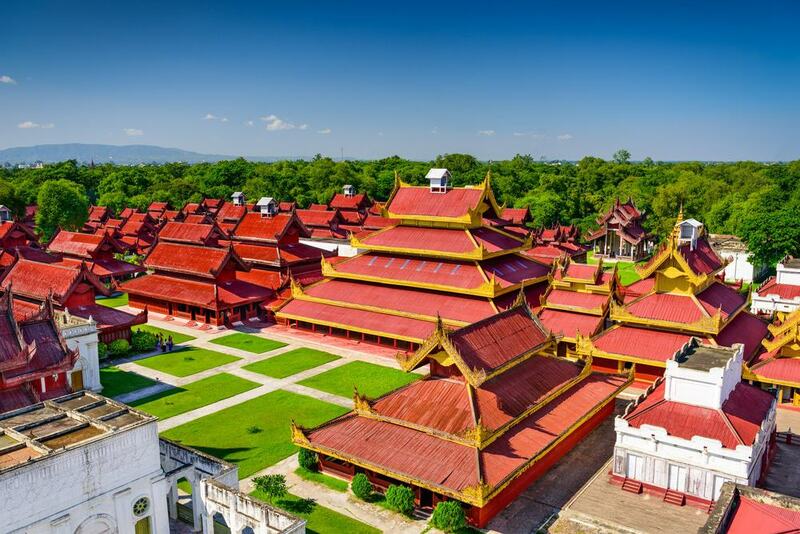 This would once have been part of the Mandalay Palace complex and would also have been the royal residence of King Mindon who is said to have died here in 1878. When King Thibaw came to the throne he was fearful of the ghost of King Mindon and had the building ripped down and rebuilt outside the palace walls where it was then converted into a monastery. The Skinny Buddha was built in 2011 and stands at a height of 75 feet. The image is said to show the Buddha in meditation and some people say that it looks more like an anime image than a traditional depiction. The main reason to come and check out the Buddha is that this image is designed in a modern style which is also very different from many other statues in the region which makes it worth the visit alone. One of the reasons that visitors usually rave about Mandalay is down to the terrific street food on offer here. 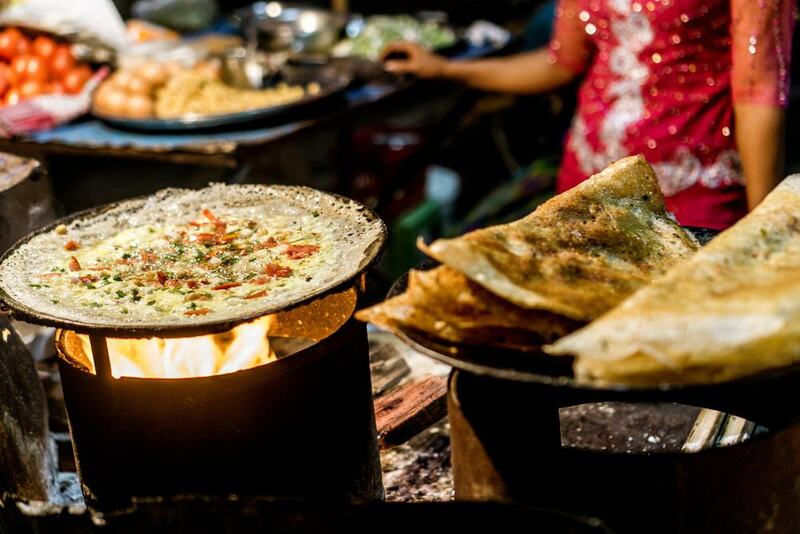 This is due to the sheer variety of bites on offer such as the Indian bread stalls that serve roti with dipping sauce. You will also find a number of Chinese restaurants all over town that sell classic dishes like chicken with cashews and the city is also covered in local tea shops that sell drinks and local iconic plates such as tea leaf salad. Close to Yankin Paya is a newly built monastery in Mandalay which is known for its iconic stupa which is made of brass. 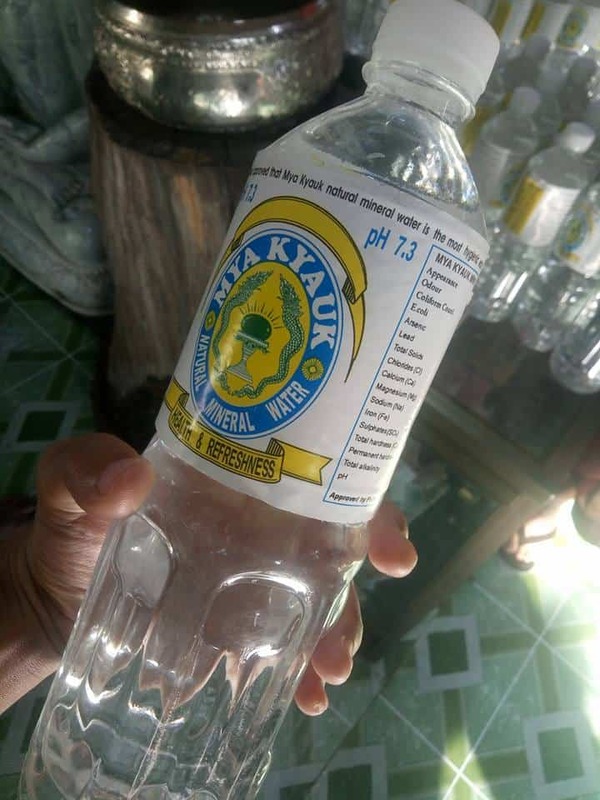 Mya Kyauk is known for being the spot of alkaline mineral water which means that it is also a place of worship due to the mineral properties found here. Apparently the waters around Mya Kyauk can cure ailments such as diabetes and gout and you can sample a glass when you visit this unusual and quirky monastery building. 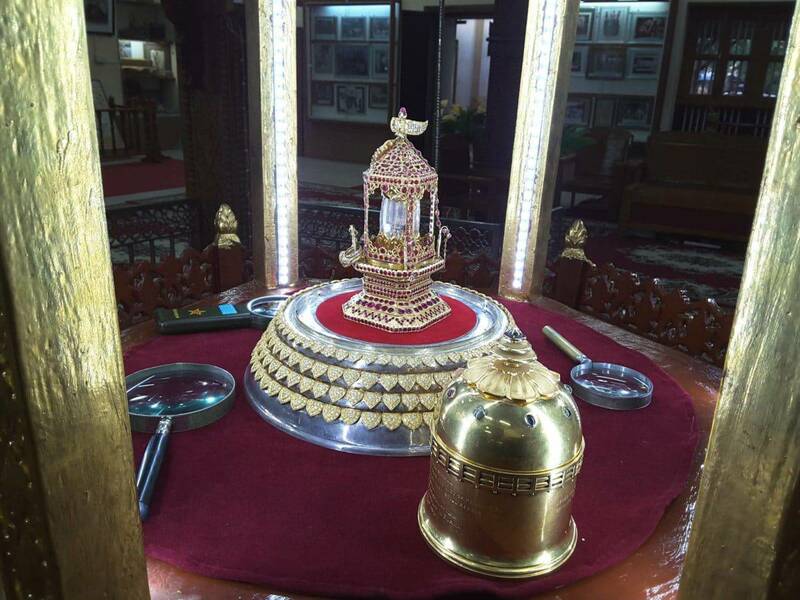 The Peshawar Relics is basically the name for three small shards of bone which are important items in Buddhism. They were discovered by the British in 1908 and what would have been found in a grand stupa in Peshawar which is now in modern day Pakistan. Now you can check out these relics in the U-Khanti Monastery and this is also an important site of pilgrimage for those of the Buddhist faith. 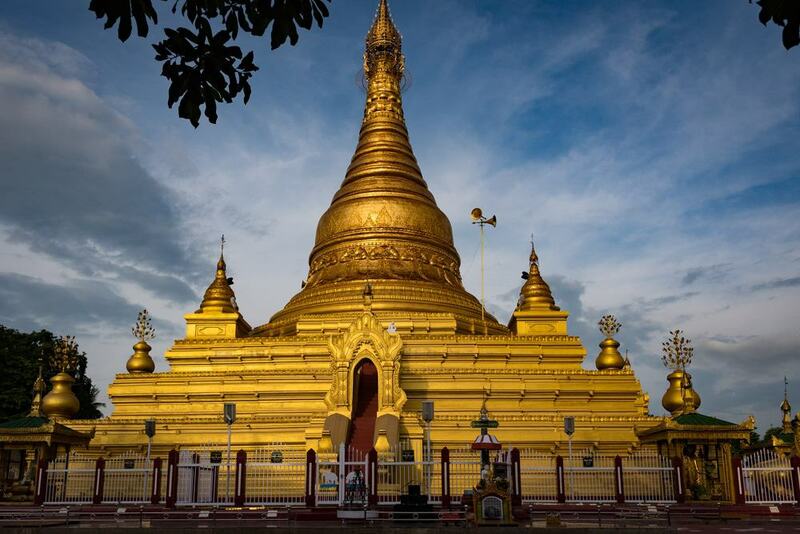 Eindawya Paya consists of a large stupa covered in gold leaf which was built in 1847 in the time of King Pagan Min on the spot of what would have been his palace. The complex here is known for its serene atmosphere and you can wander around and soak in all the history of this famous spot. Just make sure to take off your shoes as this became a source of contention in 1919 during the British colonial period and several monks were given prison sentences as a result. For a more modern side of Mandalay, head to Zegyo which is a 25 storey tower which punctuates the skyline. 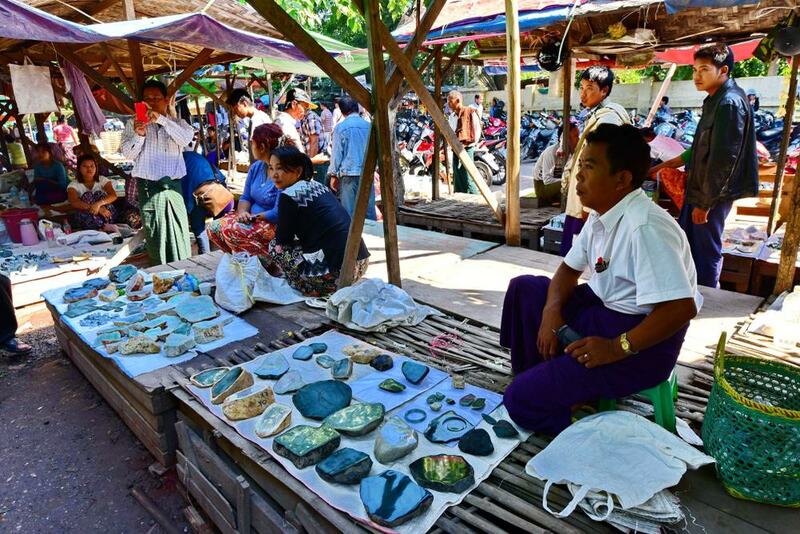 Here you will find a huge number of shops which sell everything you could ever want to buy in Myanmar. Many of the shops sell traditional textiles and there is also an older market just outside that sells towers of local fruit and vegetables as well as snacks like dried fish. If you want to pick up a souvenir in Mandalay then this is a great place to do it. The San Dha Mukhi Statue is a dainty statue that is fashioned in the image of the iconic ogress San Dha Mukhi who is in the middle of offering her severed breast to the Buddha. This is part of a Buddhist legend which says that he was so pleased by this act of self-mutilation that he made sure that she was reincarnated some 2,4000 years later in the form of King Mindon. This makes it worth the visit alone as this is one of the more unusual sights in Mandalay. If you have had enough of looking at temples and stupas then consider a visit to the main Catholic church in Mandalay. 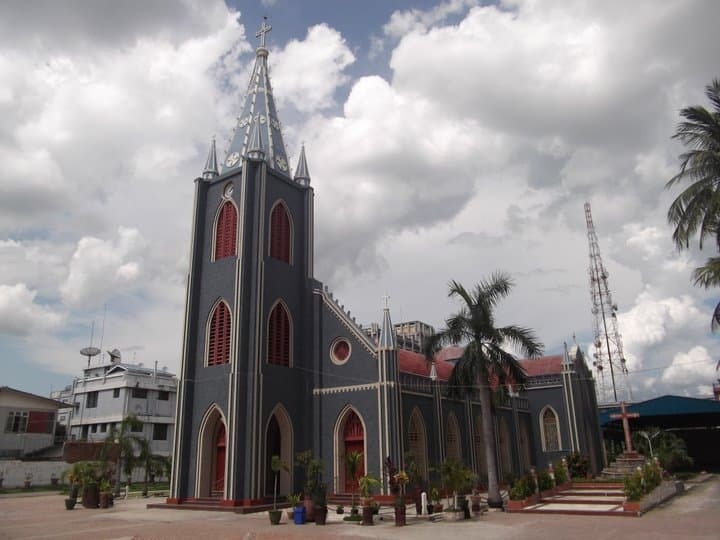 The church was founded in the 19th century and was built in the colonial style which makes it stand out in the rest of the city. Make sure that you tour the interior and soak in the serene atmosphere and the high vaulted ceilings. 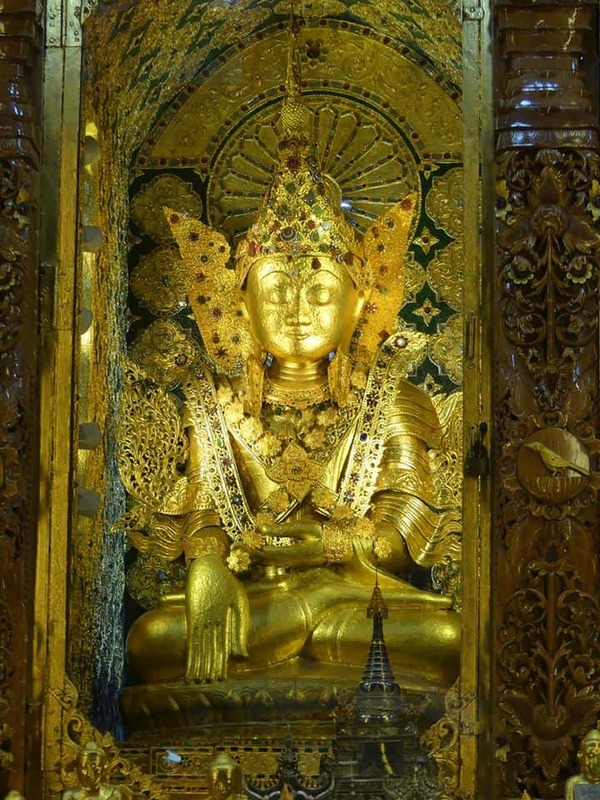 Mandalay is known for its gold leaf beaters who make sheets of gold leaf which are then used by devotees and pasted to Buddha images. If you want to know more about this then the best place to come is the Golden Rose Workshop where you can watch the artisans at work and also listen to a free talk in English that will explain the cultural and religious significance of the gold leaf beating process. 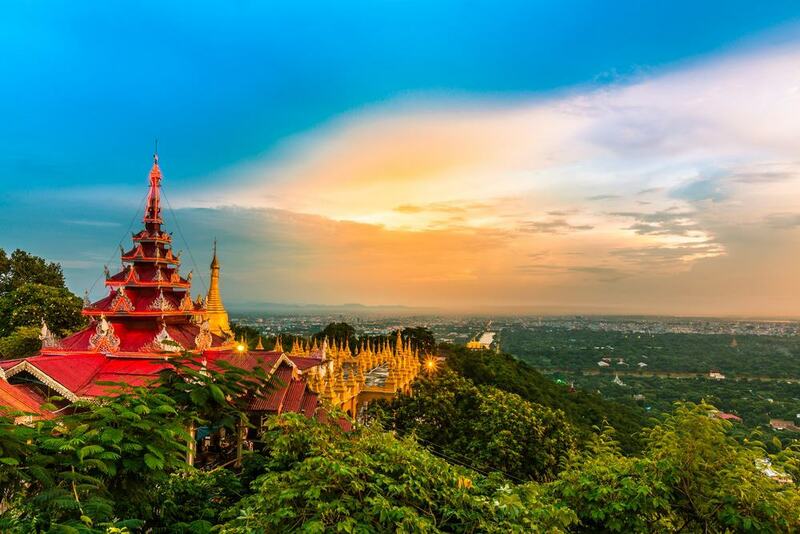 If you are looking for a workout in Mandalay then head for Mandalay Hill where you can get out of the city and take in the views. The hill is 760 feet tall and there is a stairway that will take you up the southern slope to the top. As you walk along the route you will need to pass several temples and pagodas and it takes around 30 minutes to get to the summit of the hill. It is more than worth the trek however for the uninterrupted vistas over this pretty city. If possible try to time your visit to coincide with the sunset for obvious reasons. 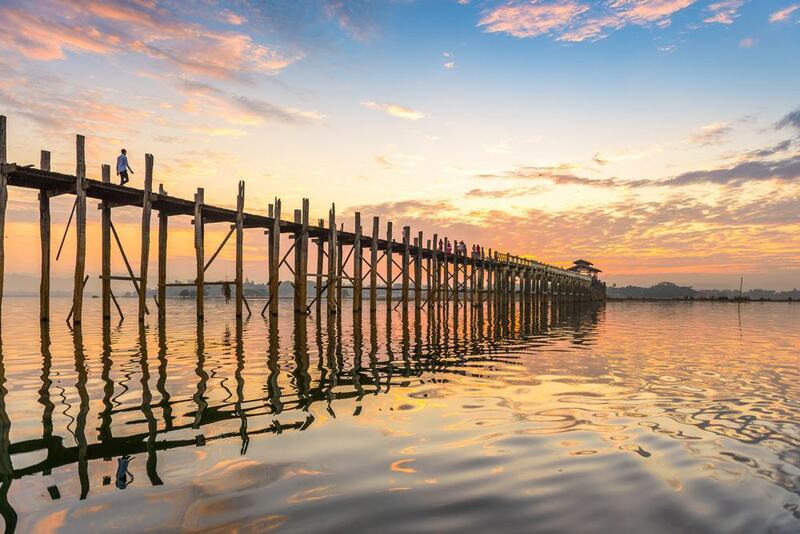 U Bein Bridge is probably the most iconic site in all of Myanmar and it stretches from Mandalay to Amarapura. The bridge is made of wood and is famous for being the longest teak bridge in the world and is reinforced in places so that it doesn’t collapse. Even with this in mind, it is still rather rickety and a trip across is not for the faint of heart. If you don’t fancy walking across, then you can also rent a fishing boat here and drive underneath the bridge to see it from a completely different angle.